How are you all? I’m fine in Belgium after traveling in 3 countries, Germany, Czech, and Switzerland, this month! Well, I’m having a solo show in Cheb, Czech Republic now, and I was so happy to have the opening reception which was nicely held on October 5th. I would like to say great thanks to Mr. Zbynek Illek, the director of Gallery 4. Also, many thanks to the gallery staff – Hana,Janila, Petra, Pavlina, Alenka who helped my show. Also, thanks a lot to Erwin Staeheli and Evelyne Staeheli from Basel, Switzerland, who visited my opening. And also, many thanks to Viktor Fischer and Alena Dvoráková from Prague, and many thanks to Mr.Pitor Borkowski and his wife from Wloclaw, Poland as well. And, yes,I would like to say THANK YOU to the people in Cheb, who visited the show and the opening!! It was really great to meet and talk with the wonderful locals of the town!! I will report about the show with “snap shots” next time in the WebNEWS. So, please look forward to it! * Galerie 4 is a Czech’s state gallery for photography in Cheb. The city is located near the border between the country and Germany, and the gallery is located in the old part of Cheb where the area was built in the 12th century. Galerie 4 was established in 1985, and it is the largest photo gallery in the Czech Republic, holding 4 rooms for exhibitions inside. 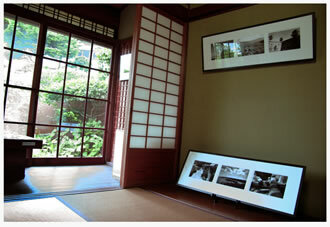 10 to 12 shows of national and international photographers are usually held in the gallery every year. 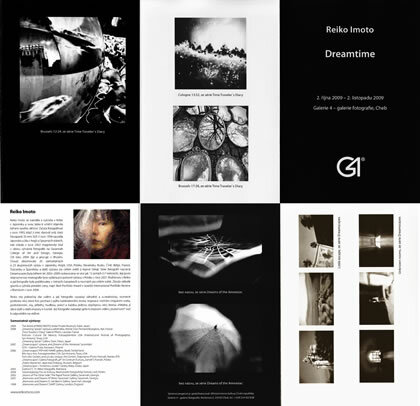 * The “Dreamtime” exhibition contains 3 photo series of my works; “Time Traveler’s Diary”, “Dreams of the Amnesiac”, and “Dreamscapes”. This is my first time to have an exhibition in the Czech Republic and also to have these 3 series together! Please visit the show if you live in Czech or you are planning to travel the country this month. Thanks! The next NEWS is a “photo report” of my last show at “Kobe Watakushi Bijutsukan” (Kobe Private Museum) in Japan, which was held from July 1st to Sept 25th , 2009. Please enjoy the report! Autumn is my favourite season, and walking into nature is one of the best things to do this season, isn’t it? This month after visiting the Czech Republic, I visited friends in Switzerland and walked into a hilly forest. On the way over the hill, I heard the most beautiful music with many tones of bell sounds from nowhere, and soon I found out that the music came from lots of cows! Walking cows with “cow bells” made such wonderful music which sounded like “gamelans” from Indonesia. I guess that I’m a “city person”, who has never heard or seen something like that before in nature. Anyway, it was a really meditative and memorable experience with cow bells… In the evening, I have also saw 4 bambies (baby deers) running in one line, crossing in front of our way. It was so sudden and fast, but I was so excited to experience the surprising moment! Hope that YOU have a good season in your city. I hope it’s not too cold there yet! This entry was posted in 未分類 on Sunday October 18th, 2009 by admin.